Retail is not dead – but it is changing. Lines between industries like retail, hospitality and entertainment are blurring, and experiences are replacing possessions in consumers’ minds. Retail brands need to follow this shift, and move their focus from what they sell to what they stand for. They must capture their customers’ attention and engage them, again and again. More than ever, they need to prove they are different from the mass, and attract consumers with original, unique experiences and personal attention and care. This is the only way to gain a place into the shoppers’ hearts. Say you run an established bike store. Things are going well, but you’d like to try something fresh. So when the business next door goes out of business, you decide to take it over, and add a café concept to your store. Your customers like it; they stop by for a flat white, and bring friends along. And when they leave the tables, they swing by in your store to see what products are new. The store is flourishing, and the café side becomes so popular you start offering take-out and delivery options. One, and then more, of your customers ask for the recipe to your signature dishes. So you set up a weekend cooking class, then another, and finally make it a regular feature. You have created a concept – and nothing stops you from expanding, and opening more locations. Unfortunately, for most retailers this kind of vision may have to stay simply a dream. Complex IT systems, poorly integrated web experiences, limited social capabilities, and applications that don’t communicate and can’t grow are common in the retail industry. As a result, businesses are left unable to follow through with their plans, and to deliver the experiences they know their customers want. At LS Retail, we believe that your brand vision shouldn’t be held back by your technology platform. To succeed in retail in today’s world you have to be prepared to think big, and act bravely. You need to be always on your toes, ready to seize opportunities. And your technology should back you up, and propel your vision. The right management system will support you as you expand your business and diversify it, and it will help you maintain control throughout. For a retailer, good customer service is often the engine driving continued success and business expansion. Unfortunately, when a brand multiplies its locations and starts operating through different channels, it can be easy to lose that personal connection with customers. To stay close to consumers without sacrificing your growth plans, you need systems that enable you to track the customer journey, and to communicate with each single customer in a meaningful, personal, human way. In other words, you need unified commerce. Unified commerce is driven by data, and powered by intelligence. Intelligence transforms disconnected data into actionable information that helps you attend to your customers, following them as they wander around the web and the world. It assists with your marketing by telling you who to cater to, and how to best speak to each customer. It supports your logistics and operations by forecasting what to keep on stock, where and when. At the same time, intelligence also helps shoppers make informed decisions on-line and in-store. When you know your customers’ tastes, birthday, and past purchases, you can help them wade through the jungle of products and information, so they can quickly find what is relevant to them. Data and intelligence can empower you to give your customer attention that is relevant, timely, and genuine. In return, you will get that most precious form of customer love: loyalty. 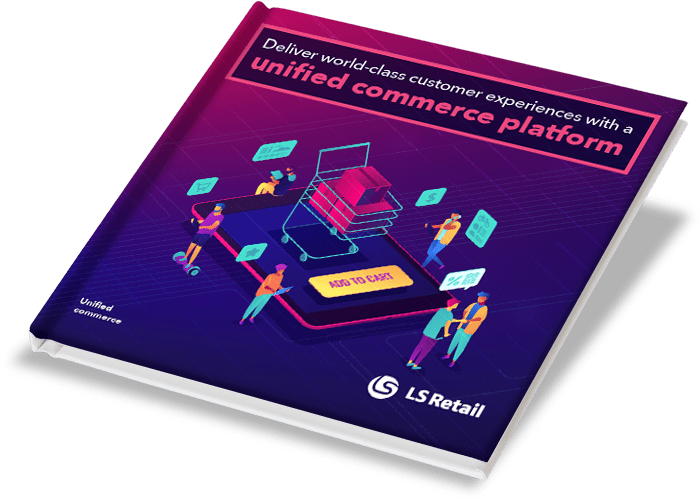 Supported by the LS Retail unified commerce business platform, your limits are pretty much endless. If you want to quickly expand your retail business, you can. If you want to branch out into opening up your own restaurants too, you can. If you want to turn your brand into a truly experience-centric company, you can. And you can do all of this while keeping that personal connection with your customers. There are just three steps you have to take to get there. It’s a big commitment, but one that will pay you back. Embrace the cloud. The cloud enables you to gather data, apply intelligence to it, and drive action. Don’t let fear of the cloud hold your business back. Trust us. Stay up-to-date, stay on the current version. We can take you to the future – but only if you decide to come along for the ride. Stay passionate. Let your desire to make your customers happy be the fuel that propels you every day. Without that, there is no reason for us to be on this journey. In return, we commit to making intelligence available everywhere in our solutions. Not because it is easy, but because it is what you need to keep delivering warm, personal experiences – no matter how big you get, or how many hundreds of thousands of shoppers you meet every day. Keep making them feel special: LS Retail solution will be there, supporting you all the way.